Most primary classrooms use a lot of consumable items. In order to keep up with the need for pencils, erasers and other such items, we often need to ask parents to donate supplies to our classrooms. 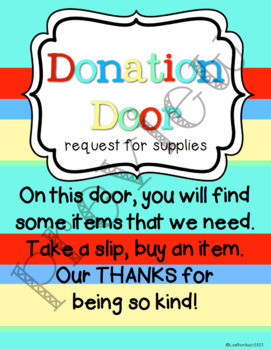 My Donation Door poster and request slips provide a cute way to post requested items. 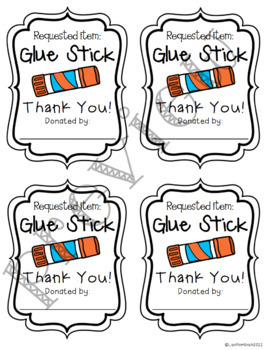 The file includes a Donation Door poster, request slips for pencils, erasers, markers, glue sticks, tissues and hand sanitizer, blank request slips to personalize your requests and a Teacher's Notes page. 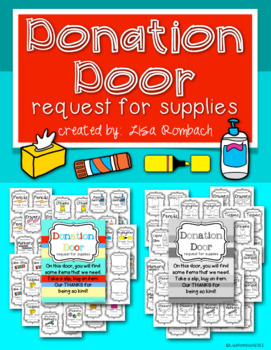 Prepare your door for open house night and be ready to start the year with all the consumable supplies you need (thanks to donations!). A color and black/white version of the slips are included as well as 2 anchor posters (one color, one BW).